Last summer one of our two outside water faucets started leaking. By the time I shut off the water to the outside faucets for the winter, it had become a constant stream. So this spring before turning the water back on, I talked with a plumber and bounced my impending repair off him. He recommended that I could simply reseal it myself. The repair was simple, cheap, and will prevent me from worrying about my water bill skyrocketing this summer. If you have a frost-proof outdoor faucet, chances are the seals will degrade over the course of 5-10 years and start leaking. 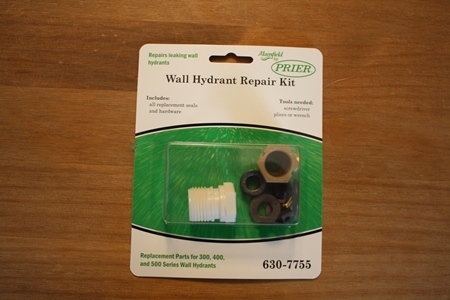 The good news is that just about every hardware store carries a universal repair kit for your style of faucet. I have an eight-inch Mansfield 500 faucet (Mansfield was bought out by Prier a few years ago, but the repair kits on the shelves are the same). 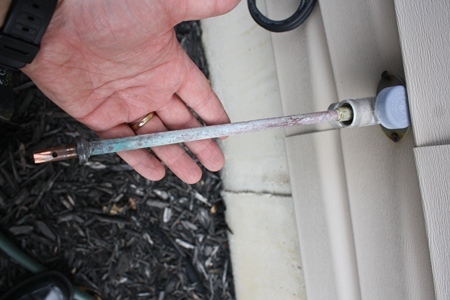 Disassembly of the faucet was a simple screw turn, an adjustable wrench, and a simple twist of the rod. All the relevant washers, rubber seals and plastic parts were included in the $9 parts kit. I removed the old, replaced them with the new, and reassembled. The roughly 5-minute job and $9 kit was well worth it and a skill I’m assuming I will reuse many times as long as I live in the northern parts of the country. Have you ever done a similar job? How long have the replacement seals lasted for you? I look forward to hearing about your experiences. Notice the skinny neck at the end with the valve seat. I had some construction workers with a bad habit of over-tightening the faucet when turning it off. This practice mashes the valve seat and stresses the brass shaft. I tried to repair the rubber part, but the end of the valve shaft eventually broke off at that skinny spot. I’d advise you to be prepared for the day you need to replace the entire sillcock. That compressed siding looks kind funky. Be sure that there’s a pitch toward the outside so the faucet can drain and do its frost-free bit. Your timing is pretty good.I was just looking at my frost-proof that had been leaking a bit when I shut it down in the Fall. My question though is this: Does this fix the valve under the plastic cover? That’s where mine began leaking – that little squirt you are supposed to get when shutting it off – – well, mine just grew and grew until I have water pouring out around that cap. Any thoughts? I had these kind of … uhh …* Wall Hydrants* and could not stand the way they drastically restrict the water flow, so I replaced them with 1/2″ I.D. ball valves. One on the inside for winter shut-off and one outside. The result was easily twice as much water flow and no need to move my sprinklers around. 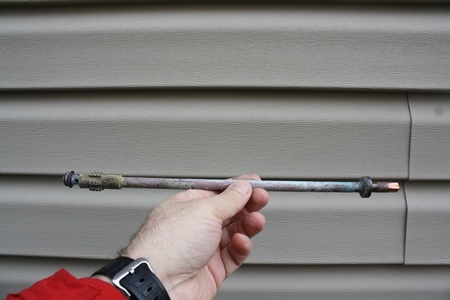 Be sure to angle taps and pipes downward so they can be drained properly prior to winter. My wife’s grandfather showed me how to do this one. I’m not a big fan of the frost-proof, but I’ve replaced all three around my house at least once each in 7 years. I installed a new one on my house last year. I also in stalled a ball-valve shut-off inside. I don’t need to come home to find some prankster has kicked out my basement window and flooded my basement with my own garden hose. I would imagine the seals in these should last a long time. They’re not going to get any near close to the wear a bathroom or kitchen faucet will. Even with those, how often are they replaced? Not often. Just repaired a Zurn(ecolotrol) wall hydrant, the kind of faucets you’ll find on instituions and the sort. The repair kit included a new valve seat, washer, and turn handle, along with new o rings. If you ever find yourself having to repair this model of faucet do yourself a favor and change everything BUT the brass valve seat, usually a leak can be fixed by replacing the worn rubber washer and damaged turn handle from people trying to stop the leak. Unless the valve seat is completely gone or worn out leave it there! Taking out the old one runs the risk of stripping out the threads on the main body…plus the new brass seat will not seal right. After several attempts of “roughing up” the new seat I still couldn’t get it to stop. Each time I removed the seat the threads would become more stripped. I finally settled on the old brass seat, and was lucky enough to have it thread correctly. The rubber washer and turn handle should be what stops the leak, use the new brass seat only if really needed. This could’ve saved me 2 hours of grief. I also didn’t mention this was on a busy school where the main had to be shut several times while I tried stopping the leak. You’ll also need a 3/8 12in long hex tool for removing the seat. Been leak free for a couple months now. Its a good idea to get a few 3/8 water keys for whoever uses the faucets the most. People will destroy the 3/8 square using needle nose and other things if they dont have that key. I need to do the same job on my Prier hot and cold frostproof hydrant. Just need to pick up the parts. I’m guessing you have to shut off the water before tackling this job. Jerry, I think the front seal just behind the knob would be able to control the leaking you are referring to. A new one is included int eh replacement kit. TB, yes, I have a main shut off to the outside faucets. It’s on a separate line before the water hits the water softener. I don’t care to use salted water on my lawn – kind of defeats the purpose of watering the lawn in the first place. When I shut down for the winter I remove any hoses from the “wall hydrant” and shut off the water supply. Then I let the water drain out of the “wall hydrants” before closing them up for the winter. I tried the same kit without sa uccessful result. Still leaks. tried various screw torque on the main washer…really didn’t make a difference. My father’s Proplus 40 frost free faucet tubing developed a leak and I need to find replacement parts. Where did you find your replacement part kits? My house was built in 1990 with 3 no-freeze outside faucets. I don’t know the brand name of those frost free faucets which in the years I’ve lived here were successfully fixed by a plumber, now retired out of state. At his last call to repair a leak , he told me about a “new type” of washer which would not need to be replaced often, if ever, if not tightened too hard. To fix a subsequent leak of one of the no-freezers, a new plumber said he would have to replace the whole faucet because “They don’t make these anymore”. However, the new faucet froze and I was alerted to “water under the house” at turn-off of irrigation for the season. The new plumber stated, “It’s fixed” within 15 minutes.